Step back in time as Sovereign Hill’s Gold Museum hosts a special event ‘The Writer’s Room’, providing Dr Blake fans with a glimpse into how the show’s writers create the characters and come up with storylines. Part of the exhibition ‘Doctor Blake’s Ballarat’ designed by the show’s own production designer, Carrie Kennedy, and curated by the Gold Museum, this special event will be held on Saturday 17th June. Providing attendees with a glimpse of what goes into producing the show, character development, and how storylines come to life, this one-off event will excite both Dr Blake and budding writers. ‘The Writer’s Room’ will allow visitors to meet the team behind Doctor Blake with a panel discussion attended by the Doctor Blake scriptwriting team, including Story Editor Paul Jenner, Script Producer Kelly Lefever, and Series Producer and Creator, George Adams. Ian Rooney, who plays Cec the Bartender in Dr Blake, will also chair the special panel discussion. This event will provide attendees with a glimpse of what goes on behind the camera of this internationally successful show, and a look into the secret world of the Writer’s Room. It will include a panel session, an audience Q&A, and a guided tour of the exhibition. The exhibition features eleven of the Doctor Blake costumes, as well as scripts, images, fabric swatches, set sketches, and props to show how the series comes to life. The Doctor Blake Mysteries series, starring Craig McLachlan as police surgeon Dr Lucien Blake and Nadine Garner as his housekeeper Jean, has been an incredible success, with the fifth season returning to the ABC later this year. 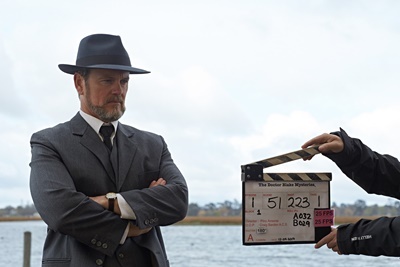 The ‘Doctor Blake’s Ballarat’ exhibition will run at the Gold Museum until 3rd September, and celebrates the international success of the hit television series, set against a backdrop of Ballarat’s most visited locations. From a recreated loungeroom from the Doctor Blake series, including Doctor Blake’s highly recognised lounge suite, to Dr Blake’s 1937 ‘Blakemobile’, the exhibition allows visitors to step into the world of Doctor Blake.